My cuties and I have made this a few times already so we just had to share the love!! Thanks to The Morning Blend for introducing this tasty treat to us! 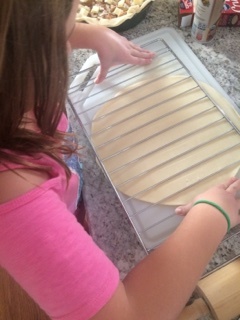 We followed this easy- peasy and delicious Apple Pie Recipe from Sendiks.com and had a ton of fun making it! Quick & Simple with a little perfecting to make our own along the way! 3. 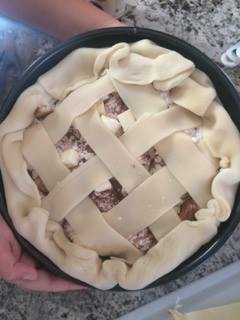 Place crust in pan with crust hanging a little over outside edges. 4. Mix Sugar, Flour & Ground Cinnamon together in a bowl. 6. Spoon Apple Mixture into crusted pan. 7. Cut Butter into small squares/ little bits. 8. Spinkle butter bits over top of apple mixture and fold in the extra crust hanging over pan. 9 Bake 35-40 minutes and let cool for another 30 minutes! 10. YUMMY YUMMY YUMMY!!! ENJOY!